Lake City, CO âÂÂÂÂ Radon testing and mitigation is a growing necessity for homeowners across the U.S. and Silver River Basement Systems is encouraging all locals to have their homes tested for radon during these winter months. Radon is a naturally occurring type-A carcinogen that easily finds its way into homes through small cracks and openings. However, radon amounts can fluctuate depending on the changing weather conditions and the homeâÂÂÂÂs ventilation. As such, the winter is the most ideal time to perform radon testing in Colorado. While most buildings are sealed tightly to maintain the warm air, radon and other toxins are also being contained. Silver River Basement Systems recommends that choosing to have radon testing performed during the winter makes for optimum resultsâÂÂÂÂthis will show radon at its worst. Silver River Basement Systems has been in business since 1991. 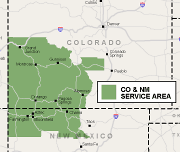 They perform radon testing in Grand Junction, CO and all surrounding areas. In addition, they offer basement waterproofing, basement finishing, and crawl space repair. Contact them today for a free estimate! Radon is the leading cause of lung cancer amongst nonsmokers. According to the Environmental Protection Agency, it is responsible for killing one person every 25 minutes amounting to 21,000 people each year. It's odorless, colorless, tasteless, and should be removed if in amounts reaching 4.0 PicoCuries per Liter or higher.